During the week I cannot under any circumstances stare a computer screen any longer than necessary, so you can track my training here. But come the weekends, we runners know the long run deserves a lot of love and attention. Good morning running princesses! Thanks for letting me be part of this blog, especially because 9 runs out of 10 I do in fact ask myself, whose idea was this?! 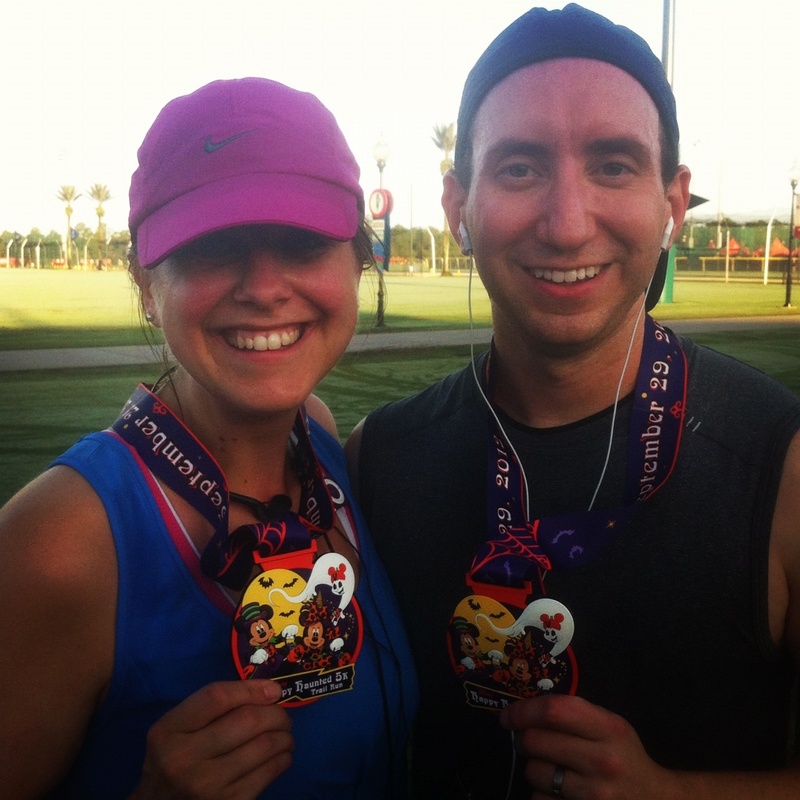 This was the EXACT thought I had last weekend when I decided to run the Mickey not so Scary 5K on Saturday morning and then ran the Tower of Terror Ten Miler that night! However, when I crossed that finish line on Sunday morning at 12:30 AM I felt amazing, better than I've ever, ever felt after a race. And I think I know why: I only missed three runs during training. That's the most consistently I've ever trained for a race. Part of my problem before has always been my schedule: I work 50ish hours a week and I'm always exhausted and we travel a lot on weekends. I had a lot of trouble consistently fitting the miles in. But with Jeff Galloway's program I could totally do 2 thirty minute runs per week and a long run to up the mileage every other weekend. And it totally worked. 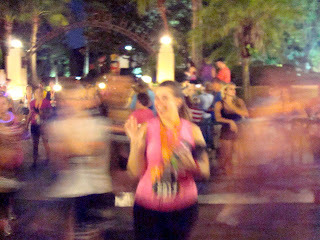 After the Disney Wine and Dine Half marathon which I ran in 2010 I could barely walk. 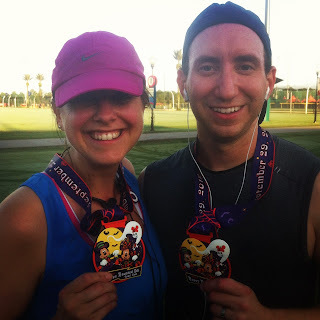 Now granted my girlfriends and I had play play played and that Magic Kingdom all day and I'd walked a ton and not taken a nap, but I barely trained. I didn't do any mileage runs and I missed a lot of midweek maintenance runs. And I paid dearly for it; I couldn't enjoy my free wine and food samples at Epcot's Food and Wine festival. I'm so glad that my 10 miler had a happier ending. I took it easy out of the start and ran the slowest pace I've ever run an official race and who cares?! I finished up right, smiling and ready to party! 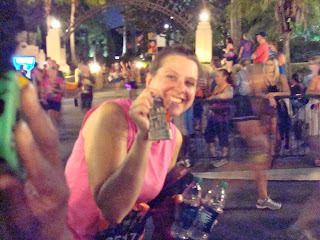 After the race, I met my Mom and Dad and husband (who had all had the most fun ever riding Star Tours and Toy Story while they waited) excitedly showed them my sweet movable action, glow in the dark medal, beasted my treat box, changed (holy MOSES WAS IT HUMID THAT NIGHT) and MB and I walked right onto the Tower of Terror and the Rock N Roller Coaster (which took forever, actually to get onto. NOTE TO ALL RUNNERS: YOU MAY BARF IF YOU RIDE A HIGH SPEED COASTER AFTER RUNNING 10 MILES IN 100% HUMIDITY). The next morning I had a slight headache (which was NOT from running but from a more dependable monthly cause) but by the time I hit breakfast with my Mickey Waffle, I was ready for a full day of fun at Epcot. The moral is always always put the miles on those legs. 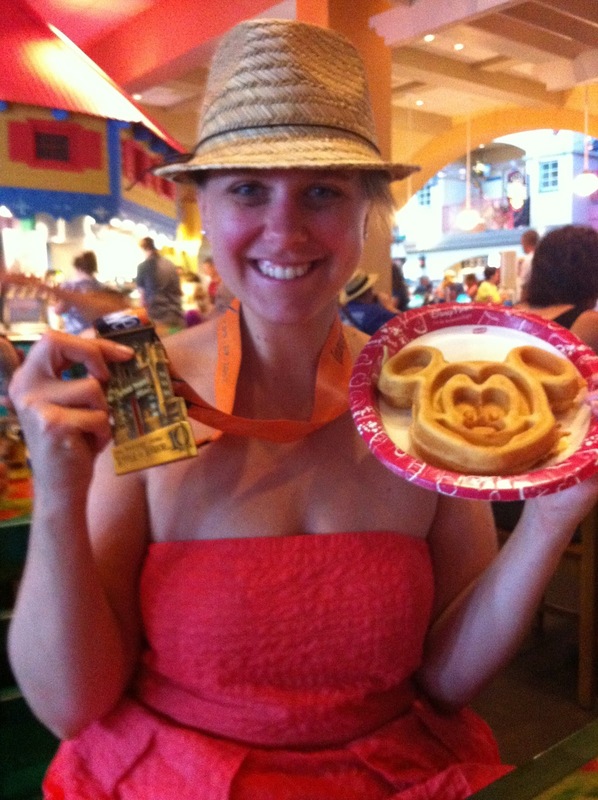 Eat well before a race and pace yourself to have fun AFTER the race. Laying with your legs in the air moaning from the dehydration headache and intesne stomach cramps is NOT worth those nights you skipped a run and the 9:10 per mile pace.